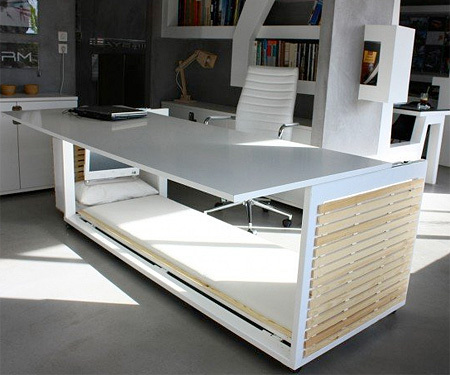 Designed by Athanasia Leivaditou of Studio NL, modern “desk bed” even comes with a small television. Relax during lunch break and watch your favorite movie or sleep for a couple of hours and regain your strength. 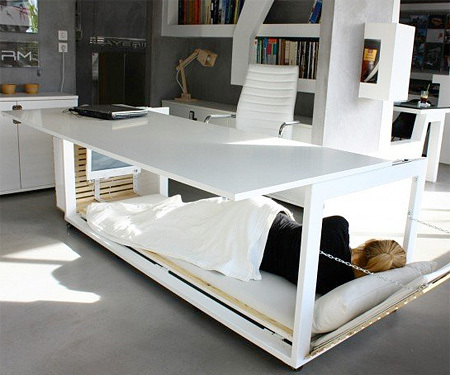 Perfect bed for workaholics and people who live in small apartments. I guess this way you never have to leave work! top of the table, upholstered lower side. Flip the cover. You can sleep on the table, not in a box. i like the idea of sleeping enclosed! Wouldn’t want to be on top and roll off. Also you have some privacy. But good luck getting this installed unless you are the boss. The slaves have to grind on! This should improve productivity at STH as the directors will no longer have to kowtow to the employees for having the audacity in even thinking about work/life balance. They should be grateful in the knowledge that executive management is providing them w/ this opportunity to continue working past acceptable norms and thus cater to the directors for picking up our slack. Yes, this should nip any sense of them wanting to go home as their home will forever be forsaken and remade in my image ! I think there should be walls up so you can get some privacy and no one will suspect anything. It’s not necessary to come back home anymore! Anyone notice the computer monitor at the foot of the bed? 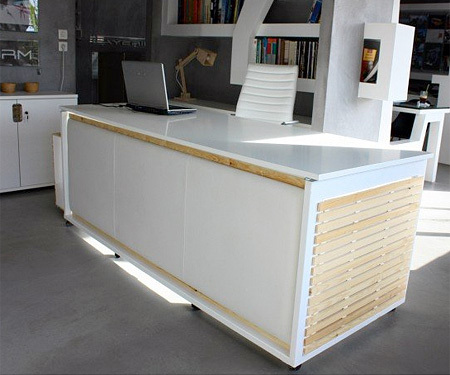 So you can work while you sleep at work. Aija, as co-director at STH I cannot agree more with your comments. Given recent slowdown of activity in the architectural market sector we must assertively respond to our employees and continually demand more from them. As a company it is easy enough for us to have the pickings from those looking for work. And that makes it much easier on us as employers to expect more responsibility in their job description and our ability to pay them less. I look at the positive in that it increases our profits, minimizes expense and will allow me to keep upgrading my Porsche’s. They need to come up with one you can retrofit into the standard gray/blue/maroon corporate cubicle. 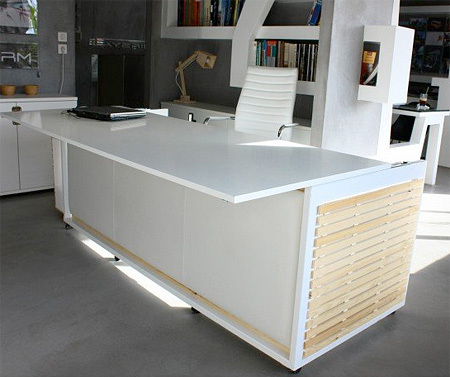 Most people with private offices and a choice in furniture don’t actually need something like this. No more excuse in getting late for work. and your co-workers not to work with/around you. You have not taken a shower within a week.